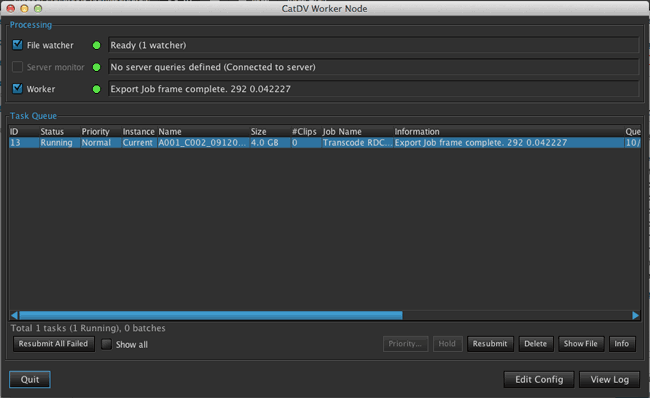 This document will show how to set up transcode from R3D to the major self contained formats using the CatDV Worker Node. This tutorial is based on OS X and before starting a copy of RED Cine X is required. Red Cine X ships with a command line tool ‘REDline’ that we shall be using to perform the transcode. In this case REDline Build 17.28605 Mac 64bit Public Release is used. Red’s tools are currently available here. The REDline tool is also available for Windows via the link above, and the process is similar to this tutorial, replacing the file paths with the Windows equivalents. In a terminal window, navigate to the parent folder, i.e. In the terminal window type ‘./REDline’. You should see the REDline help topic if REDline is installed correctly. 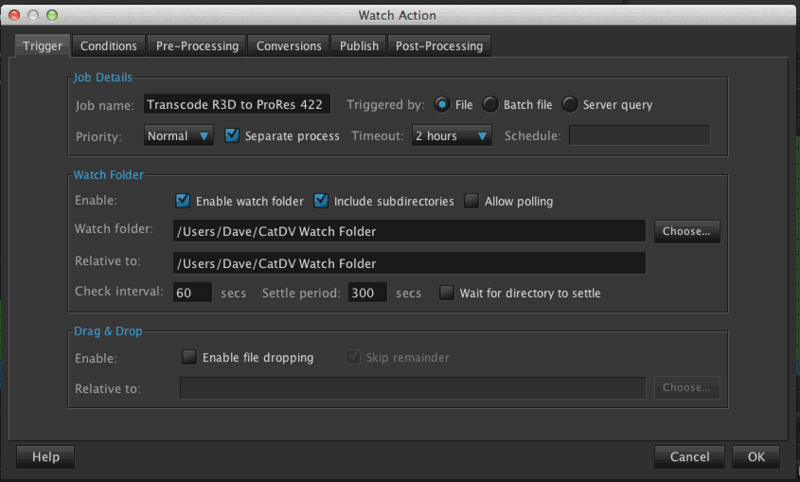 Now Navigate to the CatDV Worker, “Edit Config” and add a new action (the plus button). 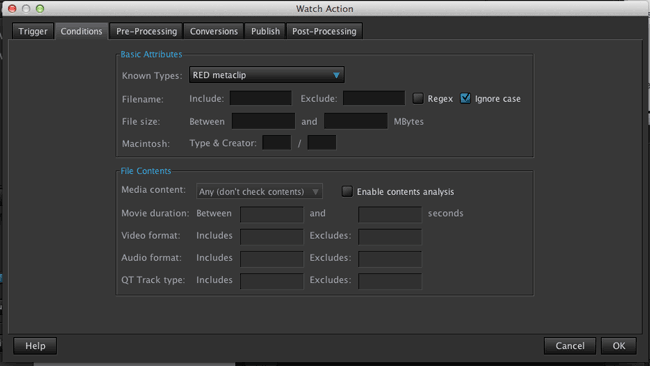 Next we want to make sure this action only applies to R3D media, so set up the “Conditions” tab to only process R3D metaclips. CatDV processes the RDC clip folders – the RDM magazine file name is automatically imported as the ‘tape’ reference in CatDV. (note CatDV Worker 5.0.6 and above is required for this facility). Now on the “Conversions” tab we will tell the Worker to run REDLine. There are many options for REDLine including use of Red Rockets, setting formats, frame sizes, watermarks, burn ins, color and gamma settings. The reader is encouraged to explore these settings for their workflow. In this case we shall transcode to ProRes 422 HQ. Here we use the full path to REDline. $i is the input file picked up by the worker, $g is the file name excluding its extension and in this case we are writing to a fixed location. A full description of CatDV variables that can be used in the command line is here. There is more information on Troubleshooting Worker actions that use the Execute Command capability here.